Welcome from the Lake City Stinger Band! Lake City has a long and colorful mining history enhanced by community bands that were valued assets to the community. The Lake City Stinger Band was formed in the spring of 1997 with Durell Thompson as director. Band members included musicians that had retired their instruments, some for several decades, as well as beginning players. Ages of the members ranged from 12 to 82. 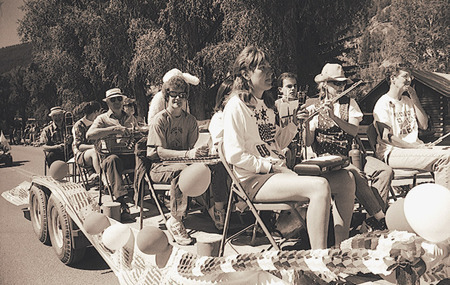 The band first played in the annual 4th of July Parade in Lake City. Over the years, the band has performed at the Best of Wellness Conference in Glenwood Springs; the Creede Repertory Theatre; and the celebration of the opening of the Black Canyon of the Gunnison National Park. Each year they perform in Lake City High School graduation ceremonies; July 4th activities; the annual Cancer Walk; community concerts; the dedication of civic projects; and Christmas events. Since 2008, under the direction of Mike Pearce, the band has continued its tradition of concerts and community service, and encourages performances from guest musicians. Lake City sits high in the beautiful San Juan Mountains of southwestern Colorado about halfway between Gunnison and Creede. Rehearsals are held every Wednesday evening at the Presbyterian Annex from 7:00 to 9:00 pm from May to September. The band is open to all with an interest in music that would like to join this dedicated and talented group of musicians. Donations to the band may be made under "Contact Us" on the Menu Bar above.